Lake Coeur d'Alene offers an unmistakable landscape that is truly unique to Northern Idaho. Clear blue waters, lily-pad covered lagoons and miles of mountain ranges create a scenery that is perfect for any nature lover or someone who wants to escape into an unforgettable adventure among an outdoor wonderland. 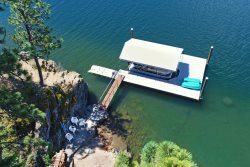 A 50 square mile lake with an incredible amount to see and do, lake Coeur d'Alene is the ideal location to spend a day or two on a high-quality pontoon boat rental. Go play on the main stretch of Coeur d'Alene lake or go explore areas like Rockford Bay; where you can stop at the famous Cedar's Floating Restaurant and dine on the water before going out for more boating fun. Lake Coeur d'Alene is a water-lover's dream, and our high-quality pontoon boat is perfect for your adventure. We offer the best quality boat rentals throughout the Coeur d'Alene area, contact us today for unbeatable rates and remember; all water-skis, tubes and wake boards are included with no additional cost to you. RESERVATIONS To make a reservation, just call 1-800-679-3661 to arrange your day on the lake. No cash deposits or shuttles needed. MULTI-DAY RENTALS Our boats are available for multi day rentals at a discount rate. Our high quality boats cannot be beat and Sour prices are guaranteed to match any rate for comparable boats. This beautiful tri-toon pontoon is brand new and ready for summer 2015! Perfect for families or large groups, this pontoon features an 11 person occupancy. For a relaxed day on lake Coeur d'Alene this boat rental is perfect. If you are looking for spacious luxury, this deluxe tri-toon will suit you well. Ryan Hopley was very friendly and helpful each and every time I called. He not only helped with the rental of this pontoon boat, but referred us to Chip at Kayak Coeur d'Alene (great guy too!) and Fins & Feathers for an all day fishing trip. Thanks for going out of your way Ryan!! Everyone was VERY helpful, right from the start when we were confused about the listing on both VRBO AND VRA. Kristine went out of her way to stop by the property and take some additional pictures and send them to me ASAP, as well as walk me through the details of the rental form online. Lindsey was so friendly and helpful when we arrived and made herself available to us immediately on more than one occasion during our visit. The property is wonderful! It feels, and is, very private, but is very close to town and to all that we wanted to do. It is much larger and well-appointed than we expected, even with the fabulous pictures. It is very comfortable, had a lot of room inside and out for us to relax and either be together or apart, and easily accommodated the six of us. In fact, there was an additional room that had two twin beds and a double futon that we were not aware of before arriving. The master bedroom was spacious and comfortable with TWO closets! The two downstairs rooms were lovely and private and had a very nice shared bathroom. The only thing that was less than perfect, and a bit surprising, was that the master bath had no shower. It was not a problem for us to go to the upstairs shower or the downstairs shower, and, in fact, I used the tub several times, but just a note on that. The keyless entry is a great feature, especially for a family. This was a lovely property and we would DEFINITELY stay here again!